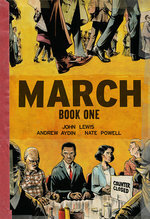 NEW YORK (November 17, 2016) — Congressman John Lewis, Andrew Aydin, and Nate Powell received an unprecedented honor last night, as their book March: Book Three became the first graphic novel to ever receive the National Book Award. 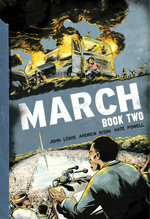 The March trilogy, published by Top Shelf Productions / IDW Publishing, depicts Lewis’s firsthand account of the Civil Rights Movement, reflecting on the role of young people in the “nonviolent revolution” of the 1960s and its direct legacy in the modern day. Its previous honors include the Robert F. Kennedy Book Award, the Eisner Award, two Harvey Awards, and a Coretta Scott King Author Honor. 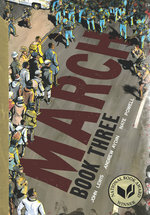 March is rapidly being adopted by universities and public school systems from New York to San Francisco, and recently spent six continuous weeks holding the top 3 spots on the New York Times Bestseller List. Nate Powell dedicated the award to his children “and their generation that will inherit this earth,” as well as to the incoming president of the United States, expressing a wish that it might transform his heart. Archived video of the ceremony’s livestream is available online at http://www.ustream.tv/recorded/92795242. 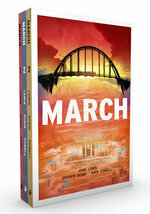 The three volumes of March are available wherever books are sold, separately as well as together in a slipcase set.